On Tuesday the WASC Senior College and University Commission granted its final approval to Thomas Aquinas College’s plan to launch a branch campus in Northfield, Massachusetts. With accreditation now secured, Thomas Aquinas College, New England, is one step closer to opening its doors to its first students this fall. Joining the students will be a team of eight tutors and several administrators who have likewise committed to relocating to the new campus. Plans are also under way to host a High School program in New England this summer, so that rising seniors can experience life on Thomas Aquinas College’s New England campus and partake in the College’s unique program of Catholic liberal education. In May 2017 the National Christian Foundation gave the College the beautiful, former campus of a preparatory school in Northfield which had been shuttered since 2005. 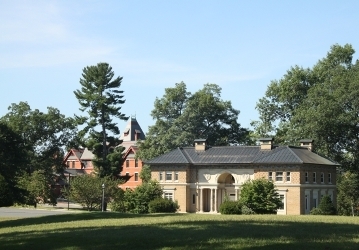 The historic property, located near the Connecticut River, consists of some 100 acres of land and includes residence halls, a library, a chapel, a gymnasium, and ample classroom and administrative space.